Our mission is to make investing affordable and accessible for everyone, so that you can make your money work harder. Start with as much or as little as you like. Just tell us how long you expect to invest for, then choose from our five simple investment styles, from cautious to adventurous, or somewhere in between. We’ll show you what your investment could be worth in the future. Then simply let our investment experts do the rest. They’ll build you an investment plan and manage it for you, every day. You can check your plan whenever you like, to see how its performing and view the investments you hold. Top up your investments at any time via your dashboard. You can even withdraw your money any time, if you need to without penalty. 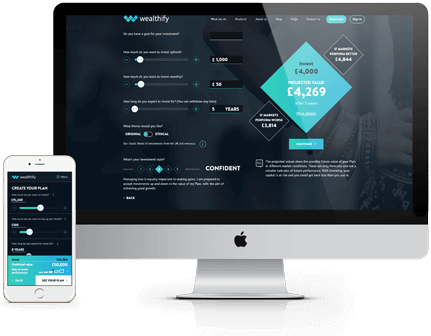 Wealthify helps you to break down the barriers to investing. You can start with just £1 in a Stocks and Shares ISA, Investment ISA, a general investment plan, or an ethical investment ISA. It takes less than 10 minutes to sign up and Wealthify’s experts do everything, picking your investments and managing them for you, every day.